Spin Tires is a unique, on what not similar game that simulates riding on the road. The gaming possibilities are almost endless - you can drive a powerful car through the woods, through difficult sections of the route using the efforts of several machines, to transport goods by almost impassable roads, to cross the river wading through the river, to reconnoiter the area or just enjoy the atmosphere so well, listening to the sounds of birds and animals. Detailed game physics and mechanics deserve special attention: your machine may hang on the rocks or get stuck in deep mud and pull it will be possible only with the help of other equipment. Gameplay is built on the basis of the free world, but you still have the game problem. For example, transportation of forest. Sounds easy, but often you can run them much harder than it might seem - in order to get through a difficult forest road on a heavily Laden truck might require a lot of effort and techniques - from the use of winches to cranes. 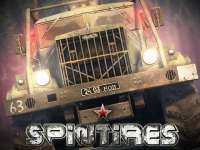 The main characters of the game are the vehicles of Soviet manufacture, but you can always expand the gaming possibilities of using mods from our website (and, they add to the game not only cars, but different maps). Strikes game detail - the world looks very attractive, and the machines behave almost like in life. Sometimes just interesting to observe how smoothly the wheels sink into the swamp or the car sways and leads to a broken track, while in all directions the splashes of mud. All previous versions of the game were free and distributed freely. At the same time the developers have presented to us already a full-fledged release version of the game, which is available on Steam. What's new we'll see here? First is the long-awaited multiplayer - play with up to 4 people at a time and this greatly expands the gaming possibilities and much stirs consumer interest. You receive the ability to perform tasks in a joint effort, pulling each other by the winch (which is another important innovation), to explore the way and in every possible way to show mutual support. You can organize the whole caravans with the possibility of refueling or repairs in a way. Secondly included in the standard set, the fleet was much more diverse - now it's not only well familiar to us on the game MAZ, UAZ, KrAZ, new GAZ, ZIL, Ural and KAMAZ. Plus available in different modifications of the chassis and the vehicle such as cargo truck, fuel tank, manipulator, crane, and so on. Thirdly, the game added the water and flying in all directions the dirt, which makes it even more realistic and attractive. The result was quite independent exciting game with realistic mechanics and a lot of potential. Let's hope that in the future the developers will actively develop the project and add interesting gaming features.